Ice packs are a thing of the past, and hot compresses don’t stay hot for long. 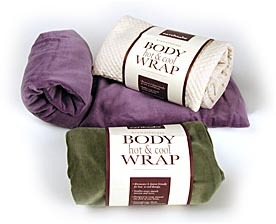 It’s time to make the switch to efficacy and permanence in the form of the Earthsake Body Wrap Pillow. Being a pillow is actually the least impressive of its functions. Primarily it is used for relieving stress and soreness (it’s great for cramps), whether you want to freeze it or heat it in the microwave. But where it differs from others with these capabilities is the inside. Composed completely of organic fill, our body wrap has cinnamon to calm, clove to comfort, and eucalyptus to relieve aches and cranial tightness. Physical and aromatic treatment in one. Another beautiful creation from your friends at Earthsake. Available in Sage, Lavender, & Larkspur Blue.